Gingerbread lattes are one of my favorite holiday drinks. The warm spices found in the coffee shop favorite help to warm me up just as much as the hot coffee does. 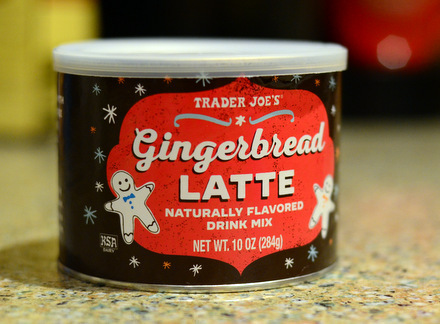 Naturally, I added Trader Joe’s new Gingerbread Latte Mix to my cart as soon as I spotted it on the shelf so that I could give it a try. The container smells delicious as soon as you open it, as the notes of cinnamon and clove really stand out. It smells sweet and spicy – just like a gingerbread man. The powder requires vigorous stirring to incorporate into hot water or milk, so I recommend using a small whisk, rather than a spoon, for the best results. The drink is just sweet enough and has a nice balance of molasses and spice flavors. It really does taste like a gingerbread cookie! I love the flavor profile, but if you’re looking for a distinct spice or strong ginger flavor, you won’t find it in the mix alone. Fortunately, this mix can be made with water as well as milk, so you can brew up some chai tea and stir the powder into that for a spiced-up gingerbread latte that will offer a little more kick. I also enjoyed the powder mixed into coffee, though I used a bit extra than recommended to ensure that the gingerbread wasn’t overwhelmed by the coffee flavor.